Gaon of Pumbedita; born about 900; died about 1000 (Abraham ibn Daud, "Sefer ha-Ḳabbalah," in Neubauer, "M. J. C." i. 66-67). He was the descendant, both on his father's and his mother's side, of prominent families, several members of which had occupied the gaonate. One of his ancestors was Rabbah b. Abuha, who himself belonged to the family of the exilarch. Sherira boasted that his genealogy could be traced back to the pre-Bostanaian branch of that family, which, he claimed, on account of the deterioration of the exilarchate had renounced its claims thereto, preferring instead the scholar's life (Letter of Sherira Gaon, in Neubauer, l.c. i. 23, 33). The seal of his family was a lion, which was said to have been the emblem of the Judean kings (Ibn Daud, l.c.). Sherira officiated first as chief judge; subsequently, in the year 968, he was elected gaon of the Academy of Pumbedita, soon after which he appointed his son chief judge in his place (Sherira, l.c. i. 41). Sherira's gaonate lasted for thirty years, and he then resigned that office on account of his advanced age, appointing his son Hai as his successor (Ibn Daud, l.c.). Being maliciously denounced by enemies to the calif Al-Ḳadir, though the nature of the accusation is unknown, he and his son Hai were imprisoned and deprived of their property, even of the necessaries of life. Sherira in consequence fell ill of grief, dying soon after at the age of 100 years (Ibn Daud, l.c., according to Weiss's emendation in "Dor," v. 174). As director of the academy he sought to reach pupils both near and far, and many of his responsa have been preserved in the geonic collections and in the works containing the earlier decisions. His responsa are similar to the geonic responsa in general, a majority of them dealing with questions of religious practise, though some of them contain expositions and comments on passages of the Talmud and the Mishnah. Indeed, his literary activity was confined to Talmudic and to related subjects. He was not greatly interested in Arabic literature, although he knew enough Arabic to be able to write in that language those of his decisions that were addressed to communities in Mohammedan countries. Generally he preferred to use Hebrew or Aramaic for that purpose. Sherira was noted for the nobility and seriousness of his character. As a judge he endeavored to arrive at the exact facts of a case and to render his decisions in strict conformity with the Law. In deciding practical questions he adopted the more rigorous view, following the letter of the Talmud with the purpose of upholding and emphasizing its authority against the attacks of the Karaites. He frequently formulates in his responsa rules which are highly important for the correct interpretation of the Talmud. For instance, he declares that the term "miẓwah" designates in some passages a command that may not be broken with impunity, but in other passages denotes merely an admonition with which it would be commendable to comply, but which may be disregarded without fear of punishment ("Teshubot Ge'one Mizraḥ u-Ma'arab," No. 141, in "Bet Talmud," iv. 351). Sherira was a student of cabalistic mysticism; he believed that the mystical works "Shi'ur Ḳomah" and "Hekalot" represented ancient traditions, originating with R. Ishmael and R. Akiba. He says in a responsum ("Sha'are Teshubah," No. 122) that the passage in "Shi'ur Ḳomah" ascribing human organs to God embodies profound mysteries, but must not be taken literally. Sherira wrote a work on the Talmud, under the title "Megillat Setarim." In this work he seems to have discussed the importance of the Haggadah (Aboab, introduction to "Menorat ha-Ma'or"); but the portion of the work containing his opinions on this subject has been lost. Sherira has become famous by a letter of his addressed to the community of Kairwan, which letter is the chief source for the history of the Talmudic, post-Talmudic, and geonic periods. 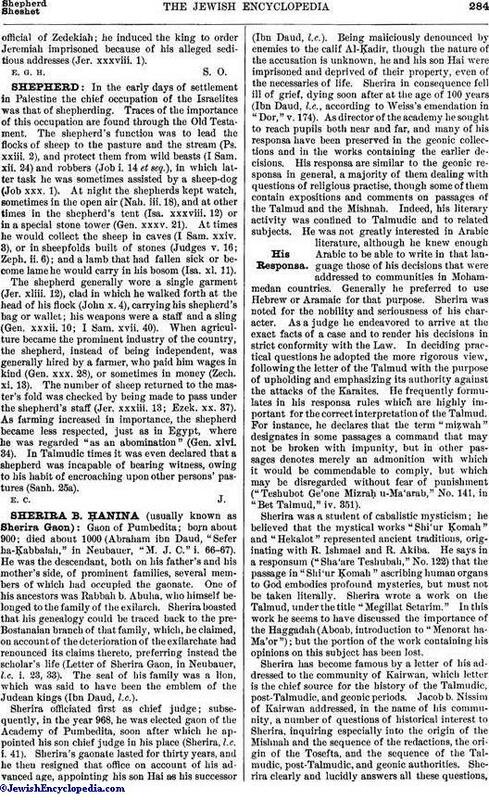 Jacob b. Nissim of Kairwan addressed, in the name of his community, a number of questions of historical interest to Sherira, inquiring especially into the origin of the Mishnah and the sequence of the redactions, the origin of the Tosefta, and the sequence of the Talmudic, post-Talmudic, and geonic authorities. Sherira clearly and lucidly answers all these questions,throwing light upon many obscure passages of Jewish history. This historical responsum, which is composed half in Aramaic and half in Hebrew, reveals Sherira as a true chronicler, with all the dryness and accuracy of such a writer, though his opinions on the princes of the Exile belonging to the branch of Bostanai, as well as on some of his contemporaries, are not entirely unprejudiced. 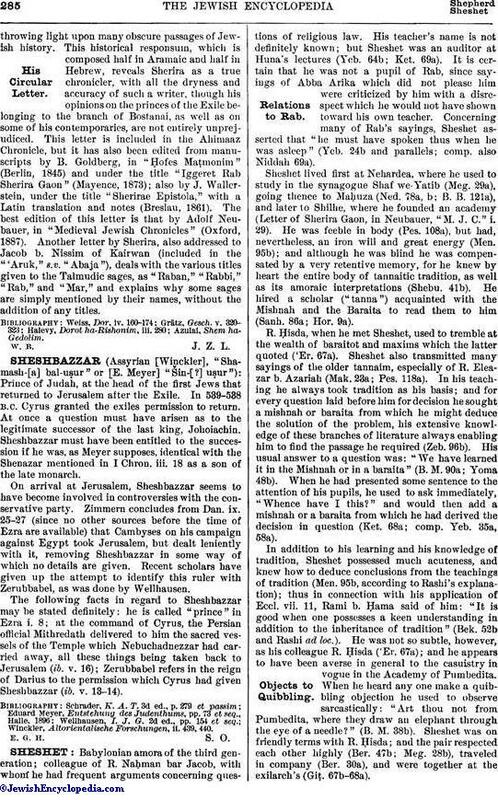 This letter is included in the Ahimaaz Chronicle, but it has also been edited from manuscripts by B. Goldberg, in "Ḥofes Maṭmonim" (Berlin, 1845) and under the title "Iggeret Rab Sherira Gaon" (Mayence, 1873); also by J. Wallerstein, under the title "Sherirae Epistola," with a Latin translation and notes (Breslau, 1861). The best edition of this letter is that by Adolf Neubauer, in "Medieval Jewish Chronicles" (Oxford, 1887). Another letter by Sherira, also addressed to Jacob b. Nissim of Kairwan (included in the "'Aruk," s.v. "Abaja"), deals with the various titles given to the Talmudic sages, as "Rabon," "Rabbi," "Rab," and "Mar," and explains why some sages are simply mentioned by their names, without the addition of any titles.